This is my ususal New Years Day meal, but as I seem to be a week behind in everything, I am just getting around to making it tonight. Here in the south, we welcome in the new year with black eyed peas for good luck. Since I am a week behind, maybe it means just 51 weeks of good luck. What do you think? I really only have one other tradition and that is Hot Browns and Mint Juleps on Kentucky Derby Day, so don't expect a lot of do-overs on the recipes here. I love black eyed peas - gotta try this! just found your blog. Love your style and wonderful sense of humor. I can relate to the SOCIAL SECURITY incident, as I had to go there this week. Quite the experience!! Laura, it looks wonderful. 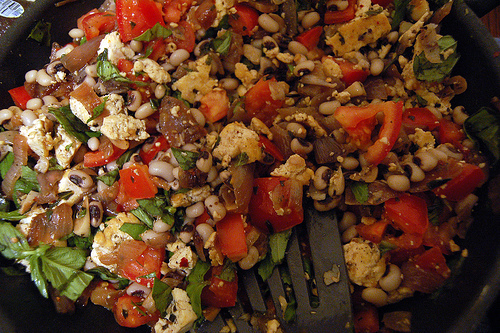 I love my blackeyed peas and I too have them every New Years Day. Good luck my friend. We need all we can get these days!! It looks delicious! Will have to try it. My daughter and her husband were here over New Years and made their traditional Lentil soup and that was wonderful also! Have a wonderful week! Yum Yum black eyed peas! Recipe looks so good-Thanks. Mmmm, looks good. I just made plain black eyed peas on New Year's Day with a little bacon for flavor. I hope it works with the luck! I don't see a lot of black-eyed peas, here on the frozen prairie. But I did get lefse for Christmas (Scandinavian treat -- sort of like a tortilla made out of mashed potatoes, delicious rolled up with butter and sugar). Sorry, I thought it had golden raisins in it, and I was peering at the picture, wondering why on earth?...lol. Then I read the ingredients and went wow, that does look delish. Here in Canada eh...snort, we have no idea what black eyed peas are, but I plan on finding out how they taste. After all, a girl has got to have some NY's resolutions. What a beautiful dish! I think I'll be pinning it. And I'll bet I have all the bottles in your header. Old bottles are terrific! We celebrated new years day with black-eyed peas for luck, turnip greens for money and cornbread because it tastes good. The last few years I’ve used the crockpot because people drop in and out all day. The rice comes in on leftover day. This week is going by so fast and your surgery is next week. You must be anxious to have it done with and on the way to recovery. Yes, you will have good luck! It sounds good, Laura! Thanks for the recipe!